The "Tag! You're It!" logo. Nova Scotians love craft beer, with the province hosting more craft breweries per capita than any other province in Canada. And obviously, Nova Scotians love the ocean, an essential part of the province’s history, culture, economy and general way of life. So while, on the surface, a partnership between one of the province’s top breweries and a global ocean research network based in Halifax might seem an odd fit, there’s a lot of common ground — or sea, if you will — there to build on. 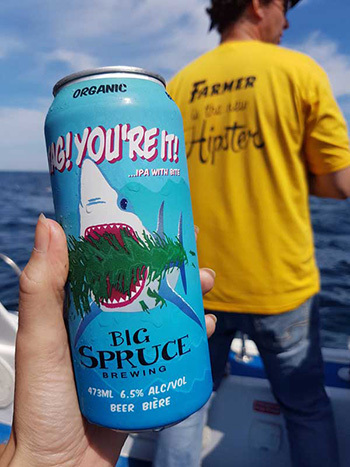 This week, the Dal-hosted Ocean Tracking Network (OTN) and Cape Breton’s Big Spruce Brewing are releasing a new beer called Tag! You’re It! Marketed as “the IPA with bite,” the shark-inspired “collaBEERation” will help support ocean research in Atlantic Canada and around the world. Fifty cents from every sale will go towards ocean research at OTN and other research programs and projects globally that critical aspects of conservation, ocean stewardship or public awareness. “The idea for a conservation beer partnership came from a mutual love of Nova Scotia’s excellent craft beer and a commitment to inspiring people to help save our oceans, lakes and the creatures that inhabit them,” says Sara Iverson, scientific director of the Ocean Tracking Network. Jeremy White, founder and alesmith of Big Spruce, says environmental consciousness is an important part of the brewery’s vision. The brewery, located near Baddeck in Cape Breton, has also become a staple pit stop for OTN field technicians doing work in Cape Breton. OTN is a global marine research platform that using electronic tags to track aquatic animals — including sharks. Since 2013, OTN has tagged tagged 70 blue sharks off of Nova Scotia. Sharks, which are critical ecosystem regulators, are among the most threatened wildlife on the planet largely due to overfishing, bycatch and climate change. Given this, the idea was spawned to pay tribute to sharks with the new beer. A total of 20,000 cans are being produced of the new IPA. The first batch debuts this Thursday, August 3 — fittingly, International IPA Day — at the Stillwell Beer Bar and Beer Garden in Halifax. It will also be available at RockHead Wine & Beer Market and Bishop’s Cellar in Halifax, Harvest Wines & Spirits in Dartmouth and Cristall Wine in Bedford. A second release is scheduled for October.